For security reasons, many AWS customers run their applications within an Amazon Virtual Private Cloud environment (Amazon VPC). With Amazon VPC, you can launch Amazon EC2 instances into a virtual private cloud, which is logically isolated from other networks—including the public Internet. With an Amazon VPC, you have control over its IP address range, subnets, routing tables, network gateways, and security settings. In order to access the public Internet, your VPC must have an Internet gateway—a virtual router that connects your VPC to the Internet. This allows applications running on Amazon EC2 in your VPC to access Internet resources, such as Amazon DynamoDB. Many customers have legitimate privacy and security concerns about sending and receiving data across the public Internet. Customers can address these concerns by using a virtual private network (VPN) to route all DynamoDB network traffic through the customer's own corporate network infrastructure. However, this approach can introduce bandwidth and availability challenges. VPC endpoints for DynamoDB can alleviate these challenges. 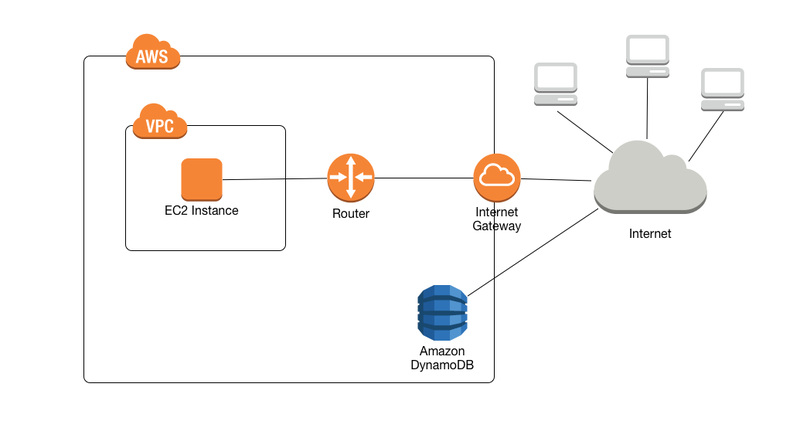 A VPC endpoint for DynamoDB enables Amazon EC2 instances in your VPC to use their private IP addresses to access DynamoDB with no exposure to the public Internet. Your EC2 instances do not require public IP addresses, and you do not need an Internet gateway, a NAT device, or a virtual private gateway in your VPC. You use endpoint policies to control access to DynamoDB. Traffic between your VPC and the AWS service does not leave the Amazon network. When you create a VPC endpoint for DynamoDB, any requests to a DynamoDB endpoint within the region (for example, dynamodb.us-west-2.amazonaws.com) are routed to a private DynamoDB endpoint within the Amazon network. You do not need to modify your applications running on EC2 instances in your VPC—the endpoint name remains the same, but the route to DynamoDB stays entirely within the Amazon network, and does not access the public Internet. 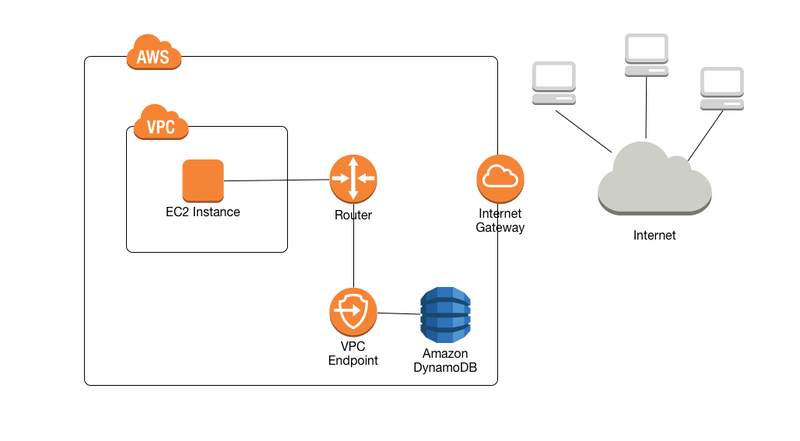 The following diagram shows how an EC2 instance in a VPC can use a VPC endpoint to access DynamoDB. This section walks you through setting and using a VPC endpoint for DynamoDB. In this step, you launch an Amazon EC2 instance in your default Amazon VPC. You will then be able to create and use a VPC endpoint for DynamoDB. At the top of the list of AMIs, go to Amazon Linux AMI and choose Select. At the top of the list of instance types, choose t2.micro. Go to Network and choose your default VPC. Skip this step by choosing Next: Tag Instance. Skip this step by choosing Next: Configure Security Group. In the list of security groups, choose default. This is the default security group for your VPC. If you do not have an Amazon EC2 key pair, choose Create a new key pair and follow the instructions. You will be asked to download a private key file (.pem file); you will need this file later when you log in to your Amazon EC2 instance. If you already have an existing Amazon EC2 key pair, go to Select a key pair and choose your key pair from the list. Note that you must already have the private key file ( .pem file) available in order to log in to your Amazon EC2 instance. When you have configured your key pair, choose Launch Instances. Return to the Amazon EC2 console home page and choose the instance that you launched. In the lower pane, on the Description tab, find the Public DNS for your instance. For example: ec2-00-00-00-00.us-east-1.compute.amazonaws.com. Make a note of this public DNS name, because you will need it in the next step in this tutorial (Step 2: Configure Your Amazon EC2 Instance). It will take a few minutes for your Amazon EC2 instance to become available. Before you go on to the next step, ensure that the Instance State is running and that all of its Status Checks have passed. When your Amazon EC2 instance is available, you will be able to log into it and prepare it for first use. The following steps assume that you are connecting to your Amazon EC2 instance from a computer running Linux. For other ways to connect, see Connect to Your Linux Instance in the Amazon EC2 User Guide for Linux Instances. You will need to authorize inbound SSH traffic to your Amazon EC2 instance. To do this, you will create a new EC2 security group, and then assign the security group to your EC2 instance. Description—type a short description for the security group. When the settings are as you want them, choose Create. Choose the Amazon EC2 instance that you launched in Step 1: Launch an Amazon EC2 Instance. Choose Actions --> Networking --> Change Security Groups. In the Change Security Groups, select the security group that you created earlier in this procedure (for example: my-ssh-access). The existing default security group should also be selected. When the settings are as you want them, choose Assign Security Groups. You will need to specify your private key file (.pem file) and the public DNS name of your instance. (See Step 1: Launch an Amazon EC2 Instance). The login ID is ec2-user. No password is required. You are now ready to create a VPC endpoint for DynamoDB. In this step, you will create a VPC endpoint for DynamoDB and test it to make sure that it works. The output will show a list of DynamoDB tables that you currently own. (If you don't have any tables, the list will be empty.). In the example output, DynamoDB is one of the services available, so you can proceed with creating a VPC endpoint for it. In the example output, the VPC ID is vpc-0bbc736e. Create the VPC endpoint. For the --vpc-id parameter, specify the VPC ID from the previous step. If you want, you can try some other AWS CLI commands for DynamoDB. For more information, see the AWS CLI Command Reference. Log in to your Amazon EC2 instance. In the example output, the VPC endpoint ID is vpce-9b15e2f2. The empty array  indicates success (there were no unsuccessful requests). Choose your Amazon EC2 instance. In the confirmation window, choose Yes, Terminate.